The power cable leads and cable splitters on this page are used in video surveillance system and other low voltage electronic installations. CCTV Camera Pros mainly supplies them for use in running power, such as 12V DC, 5V DC, 24VAC, to CCTV cameras, IP cameras, and HD security cameras (AHD, HD-TVI, HD-CVI, HD-SDI). You can view installation wiring diagrams here that show how they are typically used by our customers and partner installers. The above diagram show how PT-4 leads are typically used when installing CCTV cameras with premade Siamese coax cable. The AHD-BL5H HD CCTV camera used in this example is a dual voltage camera, which means that it may accept a 12V DC or 24VAC power supply. Dual voltage security cameras almost always have a terminal blog to connect a power source to, instead of the standard 2.1mm female plug that most 12V DC only cameras have. The PT-4 is used to connect a the power cable on the pre-made Siamese cable to the camera. The raw cable end of the PT-4 attaches to the screw terminal block on the camera and the 2.1mm male connects to the female side of the Siamese cables. In this example, a multi-channel power supply box is used (on the DVR end). So, a PT-3 female power lead is used to connect the other end of the Siamese cable to the terminal block of the power supply box. You can view our complete PT-4 power lead wiring guide here. The above installation / wiring diagram shows how the PT-102 can be used to share a single 12V DC power supply between two HD CCTV cameras. This lead splitter can be used with analog CCTV, AHD, HD-TVI, HD-CVI and any other type of security camera (or other electronic device) that uses low voltage and standard 2.1mm power connections. 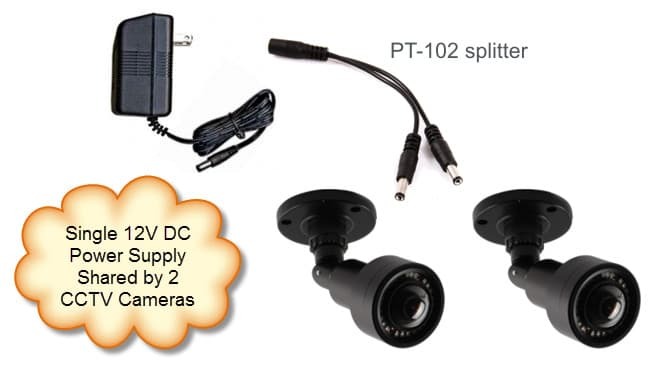 The above installation / wiring diagram shows how the PT-104 can be used to share a single 12V DC power supply between two HD security cameras and two audio surveillance microphones. This lead splitter can be used with analog CCTV, AHD, HD-TVI, HD-CVI and any other type of security camera, audio surveillance mic, or any other electronic device that uses low voltage and standard 2.1mm power connections.